Quality workshops are provided based on client needs to help increase knowledge and skills-set. Professional development workshops improve productivity, morale and overall career satisfaction. Professional Development workshops are offered face to face, via webinar and/or onsite by host institutions. Customized workshops are offered based on needs assessment or client request. To schedule workshop for your organization click here. 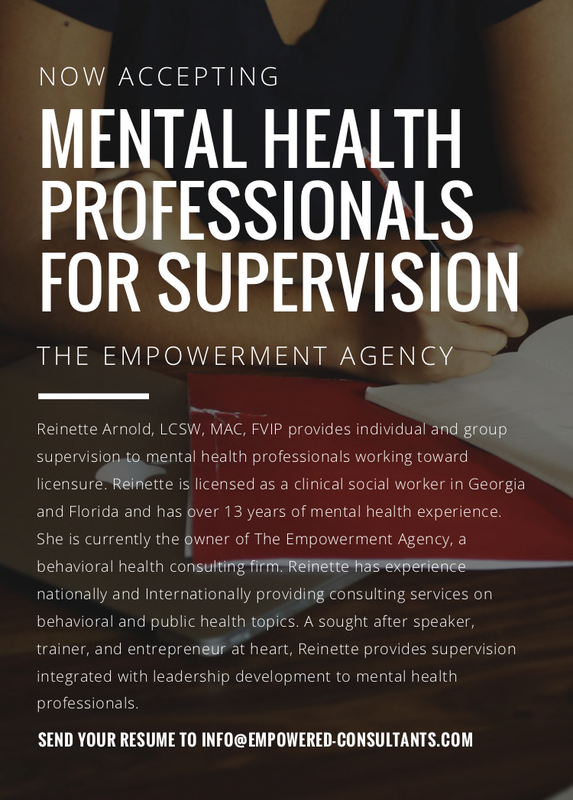 Reinette has been fully licensed as a clinical social worker since 2015 and currently meets the requirements to serve as a clinical supervisor for social workers, counselors, and other mental health professionals seeking licensure. **Please visit your local governing board for specific supervision requirements based on your program of study. Supervision services include individual and group sessions. Supervision rates include access to evidenced-based print materials, videos, and other tools used to provide clinical supervision. Supervision clients may gain access to professional development workshops and/or webinars at a discounted rate or free of charge based on space available. Licensed in Georgia and Florida. For those seeking florida supervision:Details regarding supervision opportunities for those seeking supervision who currently reside in Florida coming soon.